In 1970 I was an officer under training in the Royal Navy. In my second year I was posted to HMS Eagle, docked at Gibraltar for refit. Gibraltar is the Croydon of the Costa del Sol, boring as hell and remarkable only for duty-free fags. The captain decided to send us on “exped”. We were to walk the Rif Atlas mountains with no kit under the command of an army chap known as the “Mad Major”. He packed a heavy revolver but was better company in the open air than cooped up in a dry dock. We flew to Tangier in what felt like a motorbike with wings, and bussed to Tetuan. From there we walked into the hills, sleeping in the open under huge stars, hiring donkeys to carry our packs from village to village. In those days the towns were edgy and violent but in the villages we experienced the genuine and ordinary kindness of people much poorer than we were. Well, that was some time ago. These days I prefer my holidays a bit less swashbuckling, so when we started to plan a weekend in Morocco with a couple of friends we looked for somewhere reliable that we could explore on foot for a couple of days. We wanted an exotic, African setting with enough home comforts to make the experience a relaxing one. These included having a nice bed to sleep in, some good eating places, and retail opportunities that didn’t involve getting chased down the street or “hassled” as our friends put it. 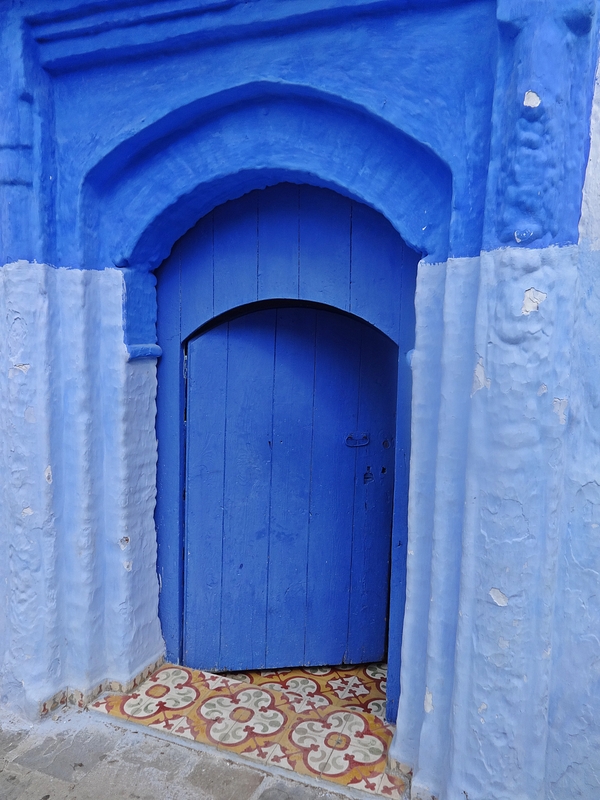 So we chose to explore the Medina at Chefchaouen or Chauoen – the Blue City of Morocco, which lies about one and a half hour’s drive south of Tangier. Chaouen is related to Andalucia and in some respects extends it because to this little town, tucked in a fold of the mountains and hidden from the world, many Jews and Moslems fled, persecuted and expelled from Spain by Spanish Christians in 1560. These refugees bought an additional level of skill learning and culture to an already mature civilization, and also an understandable hatred of Christians. No Christian was admitted into the city until 1920, when the Spanish army marched in and the it became part of Spanish Sahara. Since those times this deeply orthodox Moslem city has opened itself to foreign visitors while maintaining its traditional lifestyle. The Medina itself is populated by arab workers and, at a time when everything beautiful has its price, hasn’t yet been flogged off to rich foreigners. As a tourist you are never sure how you will be received because the whole country is in a turmoil of transition regarding its attitude to foreigners. Tourism is a major source of income for Morocco and like Andalucia it knows that if tourists run roughshod over its culture it will soon have nothing left to to sell. My wife Judy did all the work planning this. She booked a long weekend (2 nights) for four of us in two double rooms. You can extend to three nights for a bit extra. She used an agency called SMS vacaciones, and booked an “Escapada a Chaouen” holiday. Judy “upgraded” our accommodation for an additional €15 per head. We have found that it’s good value to do this. The entire package cost €703.12. That’s about €178 per head. 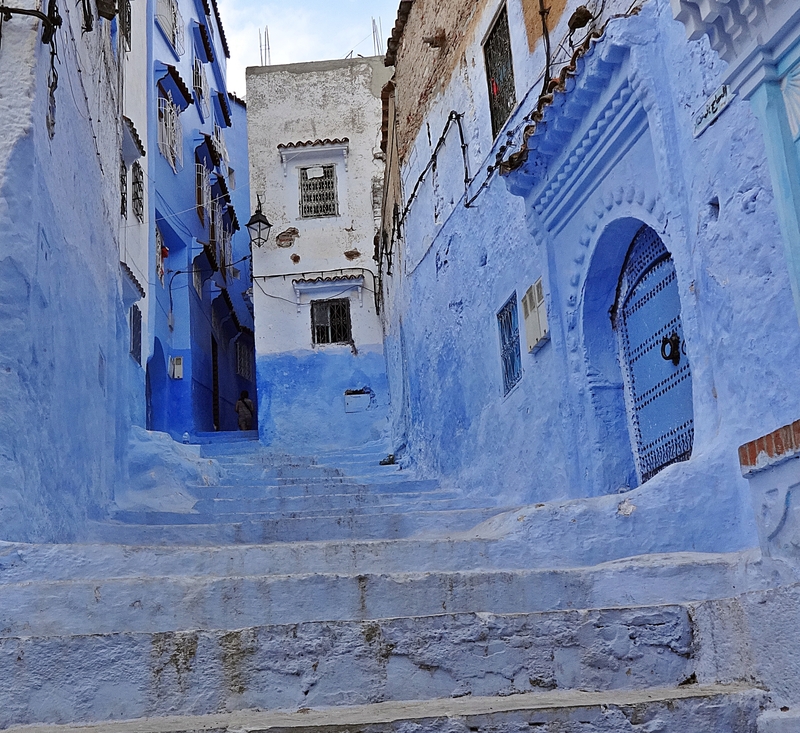 The package includes return ferry ticket from Tarifa to Tangier, transport by car/bus to Chauoen and back, and two nights bed and breakfast in the “Dar Echchauoen”. “Dar” means big house, but it is in fact hotel like in the sense that it does have a permanently manned reception but has no bar. There are about ten hotels to choose from (slightly different prices) and one is called the Parador. It isn’t a real Parador. It has a bar serving beer and spirits at exalted prices, poor value food and possibly the filthiest toilets in Morocco so avoid it. We were very pleased with the Dar Echchaouen and with the whole package we got from SMS. This consisted of vouchers for the boat, transport and hotel plus Mapfre travel insurance and papers for passport control. Our ship, a turbo-catamaran called a “Jet” left Tarifa at 12 am and we had to check in an hour in advance. The journey from Velez-Malaga took three hours including a break for me. I was the only driver so I insist on a break if I feel even a bit sleepy. I always fall into a deep sleep immediately, and I am completely refreshed after 15 minutes. Then I can drive all day. The car trip including the break took three hours and cost about €15 in toll roads round Marbella. These roads are good value especially if, like me, you drive an elderly and beat up Kangoo that finds it hard to overtake. Tarifa, though further west than Algeciras, it is a much nicer place to leave your car for the weekend. While Algeciras is a scabby port teaming with scum bags and wide boys, Tarifa has the genteel air of a broken down seaside resort. We parked for nothing just outside of its little port. The sea crossing lasted about an hour and on board you have to queue up to hand in your entry paper and get your passport stamped by immigration.We were picked up at Tangier by Luxotour, who I suppose were subcontractors. Being the only travellers for that trip, the four of us were driven across country in a people carrier. I fell asleep and am told I missed a lot – roadside markets, roadside displays of pottery and crafts, super rich and super impoverished urban and rural development, peasant ladies in eccentric straw hats and so on. We were driven to the hotel at ChefChauoen where the driver arranged to meet us for the return journey. The hotel was very good. We were taken to a suite of rooms consisting of two double bedrooms each with balconies with a fine view of the city. There was a large lounge with a flat screen television and a fridge. We had asked for double, not twin beds. In Spain this request is always ignored and you always get singles. These rooms had linkable singles and they had been linked to create huge comfortable doubles. The walk-in shower was powerful with unlimited hot water. The room suits were set in gardens including a swimming pool and a large tent against the sun with loungers inside and out. At night waterfalls were turned on and lit and the gardens lit by oil lamps. Breakfast consisted of a variety of local breads muffins and pancakes with butter jam honey and savoury spreads. There was coffee ad lib and fresh orange juice. The hotel was five minutes walk from the Medina. The main square of the Medina is an attractive place to have a coffee and watch the world go by. Animals are traded, sellers arrive and depart, gaggles of children make their way to school and columns of tourists trudge on led by an umbrella. To one side of the square is the Fort and its gardens enclosed by the old city walls , open to tourists. On the other side are the main square restaurants. Shop around to find a fairly priced coffee and use this bar as you meeting point. A coffee should be about 10dr or one euro – the same as in a cheap Andalucian bar. There is very little “hassle” apart from the odd small boy selling key rings or with a single euro to exchange for local currency at an enhanced rate. “why aren’t you at school?” gets rid of them. 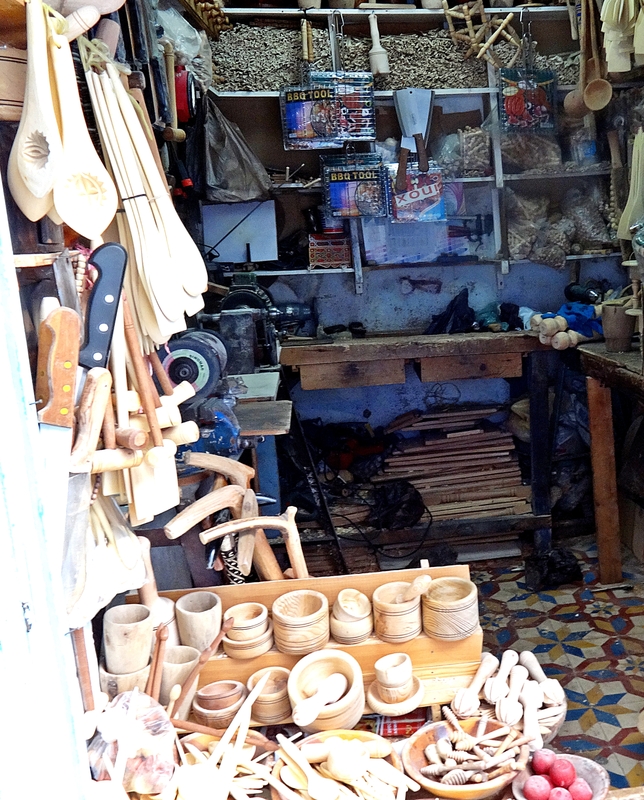 We sallied to and fro our bar/meeting point along the labyrinth of little winding streets stuffed with tiny workshops in which hand workers were producing a huge variety of traditional goods. 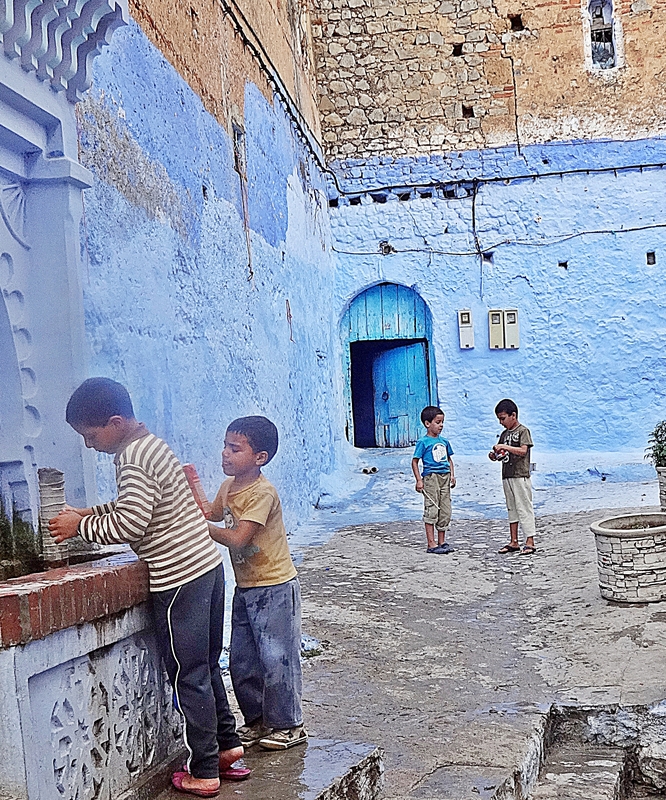 Chaouen is famous for its crafts and it is said that the craftsmen of Fez and Meknes have trained in Chaouen. The people of are charming – reserved, courteous and helpful. Two tips. If you are alchoholically inclined like me, take some booze. Chefchauoen is a city of 40,000 people and I have no doubt that alcohol can be got at a price somewhere, but not in the Medina, which is the specially holy part of the city. At the hotel they told us that they could do us a favour and “find” us some alcohol, but it would be expensive (not expensive for our sort of people of course said the receptionist). The alcohol had to be drunk privately in our rooms. Had I thought ahead, I could have packed half a dozen bottles (no! less than that) and had a quiet drink on my balcony before and after going for a meal. The hotel is fine about discreet drinking. You are not supposed to carreer into the pool singing “My way”. As it was I almost diluted myself beyond redemption with bottled fizzy water. We were forced into the hideous “Parador” for a tiny bottle of weak beer (wine only served with meals) or a miniscule shot of whisky for €4 and €8 respectively. The interior of the hotel reminded one of Hackney social services ( not that I’ve ever been there!). Some so called “designer” had hung railway sleepers from the ceiling by chains. If you feel you might have to avail yourself of its servicios, make sure you go to the lavatory BEFORE you leave your hotel. If you are a dope head on the other hand you are fine. I have no idea where or how you would buy marijuana, but the fields around the city are literally bursting with it, and is called kif. My other tip relates to the first and is also about the holiness of the Medina. The “call to prayer” does not respect your need for a good sleep or a siesta. The call itself blares out on speakers and happens all day and night but the call at 4.30 pm and 4.30 am were most memorable to me. They were recorded, not live. No doubt the Imam was in bed enjoying one of his mistresses. Hello John. I didn’t intend to be sexist about the Imam, and you are correct – there is no generic term for the Sir James Savile proclivity. What exactly is real music?